I was in beautiful Vancouver, BC a little while ago, speaking to the Managing Partners' dinner of the BC Legal Management Association. After the program, one of the managing partners came up to me wanting to discuss his unsatisfactory experience with his marketing committee and their outside consultant. It sounded like every committee member had his/her own personal agenda, and they trusted neither each other nor their outside expert. I turns out that I knew their consultant; he was a nice guy, both skilled and experienced, and I'd seen him help his clients become more successful. However, it quickly became clear to me that their lack of trust in him will make it nearly impossible to achieve any sort of gains. That evening, I got a Concierge recommendation for a nearby sushi restaurant, Kamei Royale. When eating sushi alone, as I often do while traveling for work, I make a practice of sitting at the sushi bar, which is where I've had most of my best sushi meals. I arrived early and saw the head sushi chef skillfully preparing the basics, getting ready for the evening rush. The menu looked great, and I started with a Rainbow Roll, straight off the menu. I'd struck up a conversation with the chef named Uda, who was both interesting and charming, which is typical for the sushi chefs I've met. I always request something special, whatever the chef enjoys making, or thinks I'd like -- a personal specialty that isn't on the menu. I explain my general food preferences, then place myself in their presumably capable hands. They always seem to enjoy the challenge and having someone trust their judgment and artistry. Uda first prepared a tuna sushi, uniquely seared with a blowtorch then a dab of spicy sauce. He later offered a salmon-roe sushi which was wrapped with a beautiful strip of salmon instead of seaweed (pictured). In 30 years of eating sushi, I'd never seen it prepared that way. 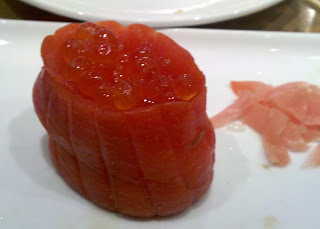 Salmon roe sushi - wrapped in MORE salmon. I love sushi, but I'm not an expert sushi chef. I want a good result, but I don't presume to know how to get there. I simply select the best expert I can afford, explain the result I want, then place myself in their well-trained hands. Then I expect them to use their expertise to achieve my objectives. I don't micro-manage the preparation of each bite of sushi. If they fail to perform, I try to figure out what went wrong, and see if they require additional guidance or support. If they simply can't perform, I fire them (i.e. I don't return to that restaurant). But if I'm not the expert, then I try to trust them until I learn that I shouldn't. I've found that if I let them do their job, then I get better results. It's the same with lawyers regarding their marketers, both in-house professionals and outside consultants. Hire the best experts you can afford, then trust them to do their job. Listen to their advice and give them the benefit of the doubt. Then, if it's not working, get different (or better) experts. As I've said many times elsewhere, "Law firms get the marketing they deserve." Find "Uda" at Kamei Royale in downtown Vancouver, above Tiffany's (604) 687 8588. What a great article, Ross. How often do lawyers face frustration when their clients try to over engineer the legal work rather than trust competent outside counsel to do their job... only to turn around and act the same with their own hired experts?! And now I'm also craving sushi!